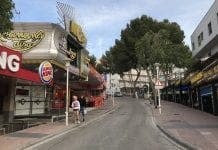 A SPANISH pensioner was found dead in Palma on the Mediterranean island of Mallorca after apparently getting his head stuck in a paper recycling bin. The 68-year-old man is thought to have accidentally strangled himself as he reached through the narrow slot of the container to retrieve discarded newspapers. Police discovered the lifeless body of the man, named locally as Gabriel Campomar Bennassar, late on Tuesday night on a routine patrol of the area. His head was trapped in the narrow opening and his arms were reaching inside. They believe he may have suffocated himself after his legs gave way as he reached inside. Neighbours said that Mr Campomar regularly collected old newspapers from the container to use on the floor of his house where he kept numerous animals. A re-cycling bin is not a “wheelie bin”. No slots in a wheelie bin. Yours Pedantically…..
We’ve corrected that now Stefanjo. Thanks.